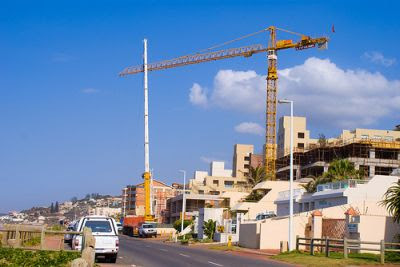 My colleagues from Master Builders KwaZulu-Natal Health & Safety department inform me that changes to the Construction Regulations have already been decided upon, and will soon be written into legislation. This will be the main topic of discussion at the Association's next Health and Safety Forum Meeting scheduled for 12 October 2009, all interested members and associated persons are welcome to attend. Neels Nortjé, the Associations Health and Safety Manager will be giving a presentation entitled "The New Construction Regulations.” Neels also serves on the Minister of Labour's Advisory Council for Occupational Health and Safety so he is no doubt best placed, to provide us with some valuable incite. The meeting should conclude at around 16:00, we look forward to seeing you. Much to the delight of Master Builders KwaZulu-Natal South Coast Regional Manager Hans Stols, our South Coast members featured very prominently at the 2009 Excellence in Construction awards ceremony recently held at the ICC in Durban. The high quality of workmanship available in the region has been placed on record with six South Coast entries having won in six different categories; an outstanding achievement which Hans is confident has set the pace for next years competition. Our South Coast winners (as follows), will again be honoured at our South Coast regional general meeting due to take place on 22 October 2009. “WELL DONE” and congratulations to them all, we look forward to next years entries. 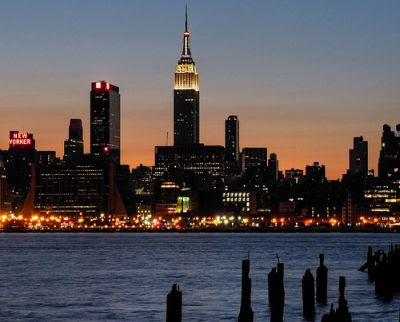 Architect William F Lamb had been given a very simple brief, the Empire State Building was to have as many floors as possible, was to be as big as possible, no space to be more than 28 feet from window to corridor and to be completed on May 1, 1931 at an agreed fixed cost. 4 Weeks Later the design and execution strategy had been decided upon. It was to be a collaboration using the combined talents of Balcom – Steel Frames, Jones – Elavators, Brutsky – Plumbing, Starrett – Contractor, Meyer – HVAC with Lamb and Raskob the masterminds driving it. The May 1 deadline was indeed met and to this day, no-one has ever matched the construction time period of just 19 months, to complete a 102 storey building. These are very exciting times for CRDC, besides being one of the four KwaZulu-Natal training providers to be awarded trade test status by CETA, they have just launched their new logo along with their new look website that incorporates the new branding. In addition to their Civils and management related skills training, they also cover all building disciplines which is great news for the industry as it means that testing no longer has to take place outside of the Province. CRDC Programs include painting, plastering, tiling, bricklaying, block laying, plumbing to basic and advanced handyman. At the launch of their new brand, a flyer was handed out that communicated the following mission statement. Creating an enabling environment which enables CRDC to better and more consistently deliver training products and services that meet and exceed the needs and expectations of our customers and beneficiaries, more cost effectively, today and in the future. The provision of outcomes based training and resource development to meet the needs of the whole construction industry at all levels. 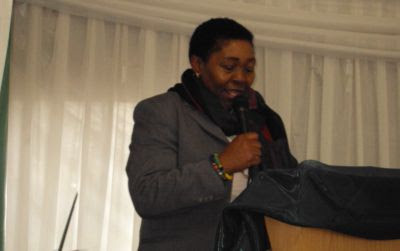 The development and mentoring of the emergent sector of the industry to enable them to participate as equals on the construction industry playing fields. The upliftment of standards of skills and life in general of all those employed and who seek employment in the construction industry. Providing ease of entrance to our training facilities for all prospective learners in a manner that will facilitate progression. Working within a consistent framework of principles and certification. Giving credit to learning which has already been acquired in different ways without formal recognition. This is done through standards based assessments. Accessing funds both within South Africa and overseas to support our endeavours. Outsourcing training providers with the necessary expertise and accreditation to maintain a high standard of human resource development in the construction industry. Through a dedicated team of trained staff who have met nationally recognized standards for educators and trainers, as well as our accredited training institutions and contracted training providers." Many of us South African’s, are looking forward to enjoying a day off work tomorrow. The public holiday I refer to is Heritage Day, a day put aside to celebrate the diverse cultural heritage that make up the Rainbow Nation. 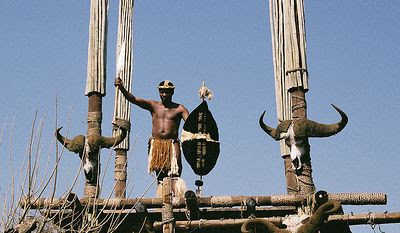 In KwaZulu-Natal, the 24th of September used to be known as Shaka Day, in commemoration of the great Zulu King. The legendary Shaka played an important role in uniting disparate Zulu clans into a cohesive nation. Contrary to popular belief, Shaka was not a 'chief'. When presented to Parliament, "The Public Holidays Bill" did not have the 24th of September included on the list of proposed public holidays. As a result of this exclusion, the Inkatha Freedom Party (IFP), with its large Zulu membership, objected to the bill being passed. Parliament and the IFP reached a compromise and the day was given its present title. It is now seen as a day to celebrate the effort made by all South Africans, in building a Rainbow Nation. The Excellence in Construction Awards, hosted annually by Master Builders KwaZulu-Natal, took place on Saturday the 19th of September 2009, at the Durban ICC. Our next e-newsletter scheduled to go out this week, will be dedicated to the occasion and will feature all the winners. Architect Shaun Killa, head designer of Atkins Middle East, is the recipient of global praise for his work in creating the world’s first wind-powered building. The South African born graduated from the University of Cape Town, has become the face of sustainable building design for his new and innovative approach to energy saving. The royal court in Bahrain had requested that Atkins Middle East, come up with a design to expand a 25-year-old shopping centre. Killa’s innovative thinking, gave birth to the now internationally renowned Bahrain World Trade Centre. It uses wind power to reduce energy consumption and has three 275kw turbines that produce a total of 700kw. Standing 240m tall, the twin-tower complex serves as the world’s largest integration, of electricity-generating turbines in building design. 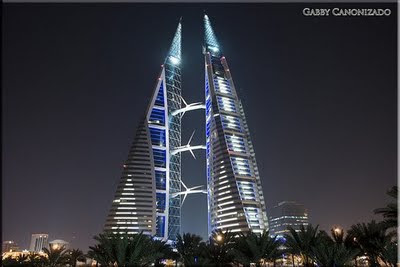 The Bahrain skyscraper has won several awards, including the Leed Platinum Award, and an American rating for green buildings. Members of the Association, who had during World War II volunteered for war service, were granted honorary membership while on active duty. The Government of the day had a responsibility of ensuring that ex-servicemen were integrated back into society and equipped with skills that would hold them in good stead. This was achieved in terms of the Training of Artisans Act popularly known as the COTT scheme. Many returning young servicemen received intensive building industry skills training, and were absorbed into the local building sector during this period. Some went on to become well known entrepreneurs in the industry, such as Bob Stevenson who became President of both the Association and BIFSA. Charles van Eck became a respected civil leader serving as Mayor of Pinetown and Chairman of the first KwaZulu Natal Provincial Housing; he was also a prominent member of the National Housing Boards. "No words can describe the joy and relief which the victory brought us and it is hoped that the great lesson of the War, which has shown that everything possible can be gained by mutual co-operation and unity, will not be lost in peace." Members of the Association are reminded that there are two initiatives on masterbuilders.co.za whereby they are able to gain additional exposure. These are permanently archived and viewed in our News & Information section. The most recent five to have been uploaded, feed to the homepage creating much sort after homepage exposure. For a company to feature as the subject of a news article, the criterion is to have accomplished something the industry would deem newsworthy. We have a category on our Blog called “Focus on a Member” which as deliberately intended, is far less formal than the News & Information module. This is where we like to relate those interesting industry stories and defining moments, in the history of your respective organisations. If you have exciting company news or a great story worthy of a Blog Post, please feel free to make contact with me on 031 266 7070. For those whose reaction to the above image is that of concern for the gentleman lying on the ground, you will be pleased to know that not all, is as it appears. If your first assumption was that he had fallen off the scaffolding, the scene was deliberately contrived to create that impression, so treat yourself to a consolation prize. It is in fact a snapshot that was taken while prepping a scene for the SafeBuild series, which as you know, will soon be appearing in a DVD player near you. The shoot is finally coming to its end with just a handful of takes needed to complete what will be a very comprehensive product. For all those involved, this project is proving to be especially rewarding. It’s been incredibly encouraging to see the level of commitment, and absolute buy-in to the belief that the work we are doing now, is going to prevent site fatalities in future. For information regarding the SafeBuild release date ………. Watch This Space. 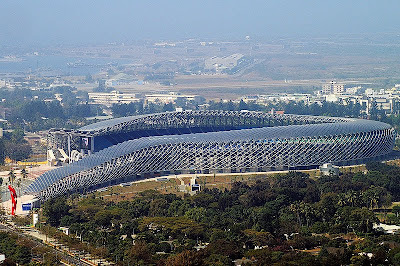 In addition to being architecturally impressive, “World Games” Sports Arena in Taiwan, is the world’s first stadium to use solar energy as its primary source of power. The solar modules used were, in collaboration with 3S Swiss Solar Systems AG, Lyss, manufactured by Taiwanese company Lucky Power Technology Co. Ltd. and to date is Taiwan's largest photovoltaic installation. Japanese architect Toyo Ito, designed this ultra-modern facility in accordance with set “Green Building” ecological requirements. At a cost exceeding US$150m, 8844 solar panels spanning 14155m2, were embedded into the structures crown. Its roof emulates the form of a flowing river, and can potentially generate 1.14 gigawatt hours of electricity every year. The stadium which seats 55000 spectators, depending on the strength of the sun, can cover up to 75% of its energy requirement. This equates to enough solar energy to power up to 80% of the surrounding neighbourhood, when the stadium isn’t being used. The night of February 1901 was hot and humid when a group of interested building contractors congregated for the inaugural meeting of the proposed Durban Builders Association. It took place in the genteel atmosphere of the Victoria café which was situated on the corner of Pine and Gardner Streets in Durban. Those present possibly talked about the recent death of Queen Victoria, whose funeral was to be held in far off London the following day. At the time, the South African Anglo Boer War was still raging unabatedly in parts of South Africa. James Reid, who along with Percy D Ridgeway convened the meeting, was elected to chair it and within the two weeks that followed, was elected the first president of the Association. Reid was an accomplished visionary and persuaded all those present by means of unanimous vote, to establish the Association. 108 years later, the hand scripted minutes of that first meeting still remains (see picture sequence above), and serves as an elegant reminder of those who came before us. Look out for the Associations Gallery of Images, the timeline spanning 1901 to present day, soon to feature in the Masterbuilders.co.za History Menu. Those of you who read Brandon’s Article entitled ‘Building Relationships – Staying in Touch’, would already be aware that we plan to visit all Association members over the next twelve months or so. One of the objectives of our In-Contact programme is to gather information that will allow us to populate your company profile on our website. The strategy is to provide members with a unique page on masterbuilders.co.za, to advertise their respective businesses. At the rate we are currently climbing the search engine rankings, (Google in particular) it will most definitely prove beneficial. These profiles will be linked to the Find-a-Builder, which is a user friendly tool to help readers find a contractor based on the type of work required, as well as the work area. Once a set of search results is displayed, users are able to click through and view your page. In addition to written content, these pages will also include a company logo, images, list of current/past projects and testimonials. From a development perspective, we are probably about two weeks away from going live with this module, and then the real work will begin. In a nutshell, this is a free and effective online marketing initiative, exclusive to Master Builders KwaZulu-Natal members. We look forward to seeing you soon. In 1962 Pieter joined National Occupational Safety Association as a Junior Occupational Health & Safety Advisor. In 1964 he was transferred to Durban by NOSA, where he was seconded to the then Durban Master Builders Association for the launch of the first National Tidiness Safety Week. He was responsible for coaching both National Winners in the inaugural National Competition. 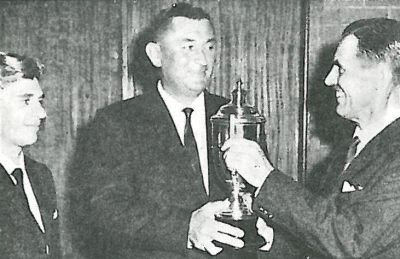 In 1965 NOSA transferred him to Bloemfontein where during the next two years in the Free State, he coached two further National Safety Building Industry winners. In 1968 he joined the former Union Steel Corporation where he established an Occupational Health & Safety Programme and also made a major contribution to the Star Grading system which is currently widely implemented. In 1971 he made an important career change and joined the Electrical Contractors Association of South Africa as General Secretary and soon thereafter its first Executive Director. After the retirement of Archie Smith who had been Executive Director of the Former Durban Master Builders Association for 30 years, he was headhunted to return to Durban. 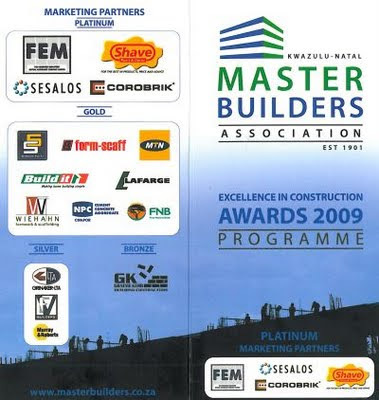 In 1975 Pieter became Executive Director of the Durban Master Builders Association, which subsequently in 1980 became the Natal Master Builders Association and in 1994 the KwaZulu-Natal Master Builders Association. In 2007 he retired as Executive Director and took on the role and responsibility of Projects Facilitator. In 2009 the Association was re-branded as Master Builders KwaZulu-Natal, while Pieter celebrated his 33rd year of involvement. 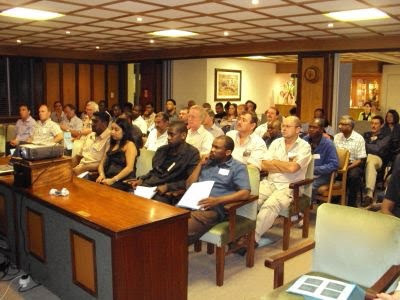 September 2009, Master Builder KwaZulu-Natal held a members’ meeting which saw 70 people, well and truly entertained. The first of two sessions planned for the evening was a very informative BBBEE presentation, delivered by Tony Kruger of DRG Outsourcing. With the construction industry having its own charter and scorecard, the information that Tony conveyed was tremendously pertinent and specific to our sector. The main speaker for the evening Aki Kalliatakis, was given a warm round of applause for his excellent presentation "Delight Your Customers." He most certainly delighted all those who were in attendance and while the crux of his message is Client Service, the manner in which he delivers it, is hilariously comical and highly entertaining. He uses eagles and ducks as an analogy to differentiate between those who aim to please, and those who are naturally unaccommodating. Drawing on personal experience, he relates to several examples while sporadically blurting out, a loud “QUACK QUACK”. If audience retention is the measure to go by, Aki gets a 10 out 10, as a loud “QUACK QUACK,” has quickly become our office mantra for describing poor service. The Stata Center at Massachusetts Institute of Technology (MIT) in Cambridge, Massachusetts, was designed by Pritzker Prize-winning architect Frank Gehry, and was opened on March 16, 2004. It was erected on the same ground where MIT's legendary "Building 20" had formerly stood, a timber-framed structure built during World War II that was home to the historically significant Cambridge MA Radiation Laboratory. Building 20 is credited with having been the breeding ground for many of the great ideas born to MIT; a requirement for new structure was that it would have to capture and inspire, Building 20's innovative and serendipitous spirit. The Stata building today houses MIT’s Computer Science and Artificial Intelligence Laboratory (CSAIL), the Laboratory for Information and Decision Systems (LIDS) as well as the Department of Linguistics and Philosophy. The major funding contributors were Maria and Ray Stata (MIT class of 1957) along with Bill Gates, Alexander W. Dreyfoos, Jr. (MIT class of 1954), and Morris Chang of TSMC. Most notably from the fourth floor upwards, the building is split into two distinct structures: the Gates tower and the Dreyfoos tower. Bridge City Mall at various stages of construction. Yesterday afternoon we posted a news article on our website entitled “Bridge City Mall Safety Achievement Milestone” publicizing the Grinaker-LTA/Enza JV excellent accomplishment of having reached the landmark figure of 2 million man-hours worked without a Lost Time Injury (LTI). In today’s blog post we draw attention to what it signifies and how momentous an occasion it truly is. Total Man-hours is the amount of time those working on a site, have collectively clocked up. Simply put, if 100 individuals work an 8 hour day, the days total would be 800 man-hours worked. Lost Time Injury (LTI) is when somebody is injured to the extent that they cannot perform their duties, regardless of whether they can fulfil another role. For example if a scaffolding assembler can no longer climb but can operate a front-loader, the contractor still gets penalized for it. The only type of injury that does not get penalized, is when immediately after some basic first aid treatment, the injured party is able to continue unimpeded. To put into perspective the magnitude of what Grinaker-LTA/Enza JV have achieved, Neels Nortjé past President of the Institute of Safety, and who currently serves on the Minister of Labour's Advisory Council for Occupational Health and Safety, is enthralled with it. He commented that while the 2 million hour LTI mark does occur in industry, to the best of his knowledge, this is a first for the construction sector and shows that it can be done. The bar has been raised. “The Spy who gave Us Her Cold” is the latest high octane adventure in the 008 series and again features Super Spy Tanya Leeuw, perilously in pursuit of old Association branding. Having closed the file on her last assignment, the epic continues with Agent 008 preparing for her next secret mission. This latest chapter sees “Roof It” play the baddie, who when parking their wrongly branded vehicle at the Essex Terrace building, triggers off a series of events that result in agent 008 being coerced out of retirement. Unbeknown to Henri Vermaak, who at the time is attending a member’s lunch, the re-branding of his vehicle is being carried out with military precision. The old MEMBER decals are covertly replaced with new ones, stickers that are available to all members, at the Master Builders KwaZulu-Natal reception. Members/Suppliers are entitled to two free decals. Additional Decals are purchased at R15 each. Decals are available at all Master Builders KwaZulu-Natal offices. Decals are only supplied to registered Members/Suppliers of the Association. Neil obtained his National Diploma in Safety Management in 2005 through UNISA and is a registered Occupational Health and Safety Professional with Institute of Safety Management. His role within the Association is that of Occupational Health and Safety Consultant, advising and assisting members on how best to conform to Construction Health and Safety standards. His reason for pursuing a career in safety is that he likes looking out for people; and making a positive contribution to their lives. Neil enjoys interacting with people from all walks of life and derives tremendous pleasure from helping them to grow. What initially lured him to the Association was the opportunity to work with Neels Nortjé who at the time was President of the Institute of Safety. 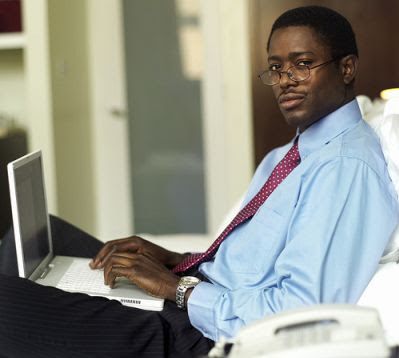 What frustrates him most is one dimensional thinking and people who are reluctant to take advice from the experts. Unmarried, has been involved with girlfriend Rinza for close on two years now. Parents are retired and live in Empangeni, also has a younger sister. If you could meet anyone in the world dead or alive, who would it be? Audi Q5, he says without hesitation. As a youngster of about 10 years old, got caught by the fire department starting a fire, punishment was writing an essay of 200 words which had to be handed in to the chief fire officer. Reads a lot and is probably a lot more emotional than colleagues would imagine. Enjoys Rugby Cricket and is a very keen golfer, plays off a 7 handicap. 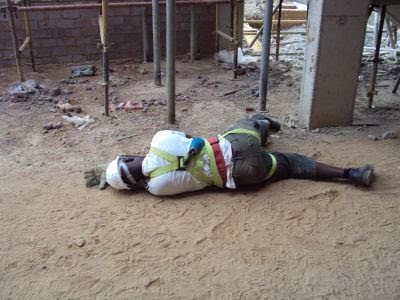 In you are in need of Site Safety Consulting, why not give Neil a call, on 031 266 7070. 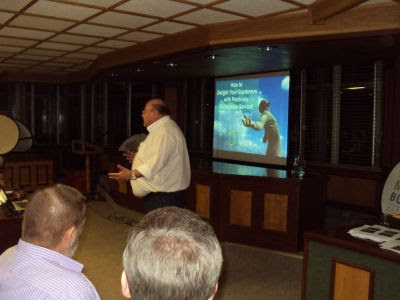 Master Builders KwaZulu-Natal South Coast Region, held their 2nd General Meeting for the year at the Port Shepstone Country Club on 27 August 2009. The event was well attended, with 65 members braving the miserable weather. The meeting was chaired by Ray Basson who spoke about the Master Builders Community Project in Gamalakhe. The project is a joint venture between the Association, Association Members, Local Government and George Enslin and involves the construction of a house for two young boys whose parents passed away two years ago. For more information about the project visit the Master Builders Website. Ray also announced that the South Coast year end function is scheduled for the 20th November 2009 promising to be something different. Michael Bertrums CEO of KwaZulu-Natal South Coast Tourism then gave an excellent presentation on methods to promote and market the region to both the national and international market. It was especially interesting to see the future impact that this will have on development and infrastructure. Michael’s presentation was warmly received. The meeting was generously sponsored by Nu Form. Mark Bolton (CEO) presented a short DVD on his company and the community projects in which they were involved. 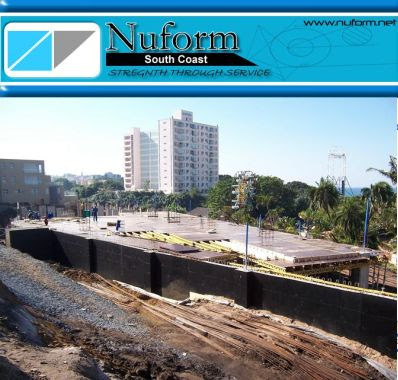 It was acknowledged that sponsorship from the likes of Nu Form was an integral part in the success of these events. The final presentation was by the Associations Commercial Manager and focused on the new corporate identity and expanded member service offering. Gary Amstutz our Commercial Manager as always presented it with great enthusiasm. Once the meeting had drawn to a close, dinner was served with members enjoying the occasion to network amongst each other.